It's been a while since I've made any progress with the Super Script Quest. Ebay has not had many of them, until the other day that is. I'm watching a Jose Theodore right now at $9.99. I really want to get this one because it would be nice to have both the Gold and Super Scripts for one player. There's two days left on the auction, so I just have to hope the price does not skyrocket like usual between now and then. The hardest thing about this project is being in college right now, I'm poor, like every other college student. I usually don't have the money to waste on these cards when they get over the $20 range, but that should change soon. As soon as I graduate in a few months here, I will be able to put more money and time into this project. This will hopefully include some card show trips and less frugal ebay shopping. It's been a while since I've post one of these so here we go. 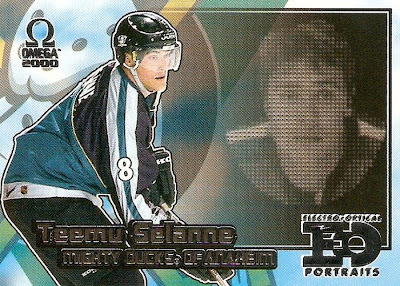 This pick comes from Pacific's 1999-00 Omega set, its an Electro-Optical Portraits Teemu Selanne. It's an interesting concept to say the least, with the die-cut portrait on the right side of the card. The team logo in the background on the left side is a nice touch. 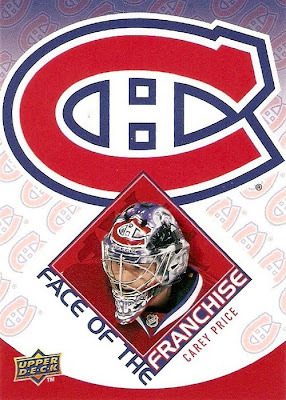 The action shot works with this card and the text and logos are not overbearing. Its also nice that they used a different photo for the die-cut image. Overall its an excellent and interesting design. 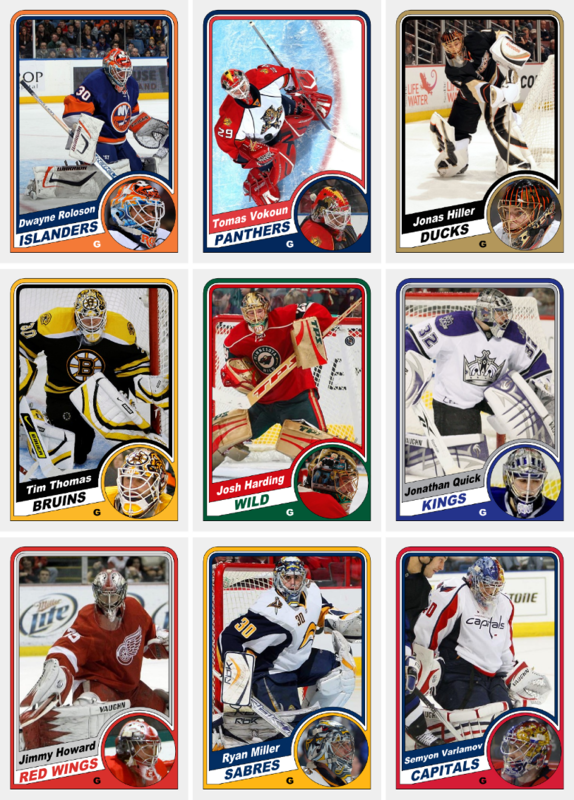 Well it’s been just over a week now since I began creating my updated versions of the 1984-85 OPC set featuring the goaltenders of today and I have just put the finishing touches on 27 of them. I chose to do 27 rather than all 30 simply because 27 makes for exactly three nine-card pages. I went with strictly goaltenders for this set and for good reason. They are the only ones who can express themselves through their equipment, especially the mask, and that makes goaltender the best position in sports. I've always loved the different mask designs as well as the pad designs and color schemes so going with all goaltenders just made sense. It's been another learning process to say the least. I found myself constantly changing the images and color schemes. I decided to make several slight changes from the original OPC design, only because I did not want to have the color pink as part of the designs. Here we go with the first nine. As you can see, I made changes to all of the original nine except for the Hiller, Miller and Harding. 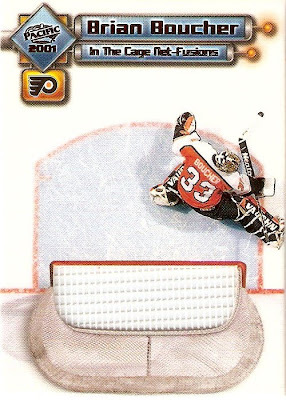 Of this first set, my favorites would have to be the Thomas and Vokoun, both have interesting action shots, unlike most of the others, I'll explain that later. 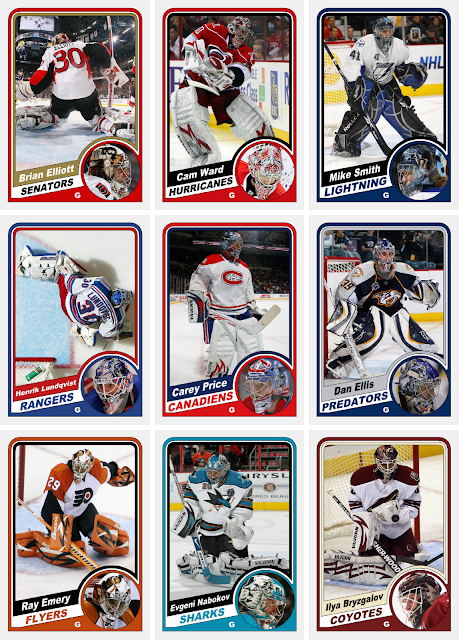 The hardest part of the process was finding just the right action and close-up image for every goalie. I tried to come up with a variety of shots, but it was difficult to find many usable images of only the goalie with no other players or officials in the foreground or background, which is why most of the action shots are simple butterfly or standing poses. Now on to the next set. 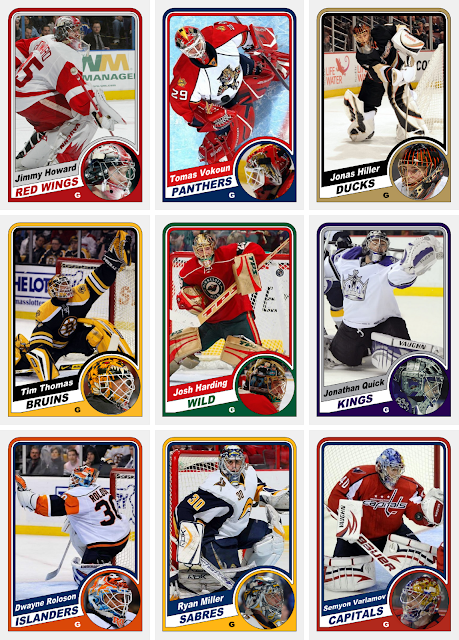 Out of these nine, my favorites would have to be the Lundqvist and Elliott again because of the unique action shots. The rest are fairly simple, although I tried to mix it up a bit with shots like Ward playing the puck and Price skating around. It was a painstaking process scouring Google images and the team website photo galleries for the right shots, but in the end I think the effort was well worth it. It was difficult to find many hi-res images so that's why a few of the action shots don't look as good. Now on to the final set. In this set, I tried to incorporate some other types of shots, like the Kipprusoff and Khabibulin. It did get even more difficult to find usable images for some of the lesser known goalies, but I managed to find something to work with. Overall I would say this first attempt at creating my own custom set came out fairly nicely. The design was simple, one, because all I did was recreate it, and two, it is a basic geometric design without any gradients or complex elements. This set has given me some other ideas as far as recreation of older sets, so hopefully I will have more in the future. For now though, I am working on a set I designed from the ground up. I've only completed two of them so far but I must say they look amazing. I'm also still working on a name for this one, I'll be sure to post them when they're all completed. 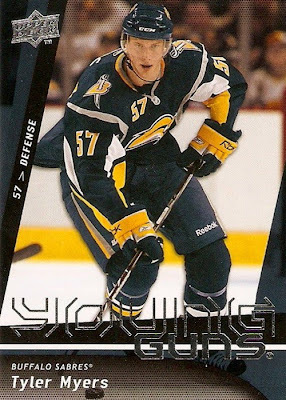 Since I started this blog several months ago, I've gotten more and more into the design and aesthetic sides of hockey cards. I've recreated several existing sets and have attempted to create a few of my own original designs as well. It's a learning process as I get more and more skilled with Inkscape each and every day. That's the program with which I've created all of the title banners for the blog and I thought it was interesting to see the evolution of it over these first few months. I seem to want to change something about it every few days and it gets better every time. This is only current up to today, but I'm sure it will be ever-changing. As you can see, the banner design has come a long way from the initial design. I like to keep the cards integrated because they are the heart and soul of this blog and what makes it even more interesting is that every one of those cards has been or will be featured. Like I said earlier, Inkscape is a learning process that takes time, but as you can tell I'm getting the hang of it. I'm not sure how many more of these there will be, but I can guarantee each one will be better than its predecessor. After reading about the 1984-85 OPC set over at MY HOCKEY CARD OBSESSION, I decided to take a crack at creating a few 'updated' versions with Inkscape of some of my favorite current goaltenders from around the league. Here's what I came up with. 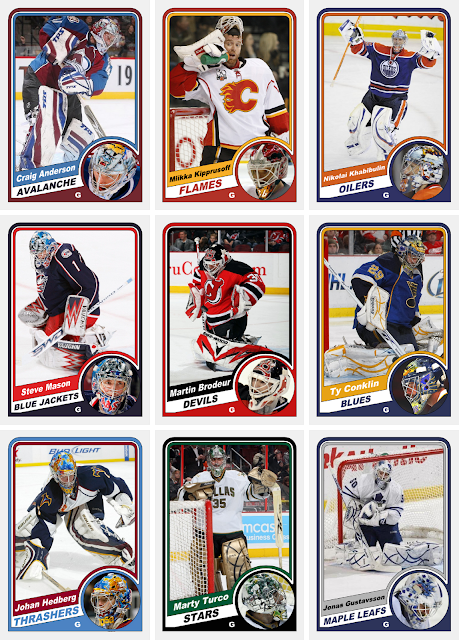 They were fairly easy to create and I think they came out pretty nice, so I've decided I want to make my own 30 card set featuring one goaltender from every team. There are one or two slight differences from the originals though, but nothing very noticeable. I liked the way this set looked and I wanted to simply swap out the names and pictures, which is basically what I have done. The one thing I made sure of was matching the goaltenders' masks in both the action shots and close-ups. This may become another one of my side projects, but we'll see what happens. I was out today and decided to pick up four more retail packs of 2009-10 Upper Deck Series 1 because I haven't opened any packs lately. I'm beginning to like this set more and more, the only problem with it so far is the number of duplicates I've been pulling. 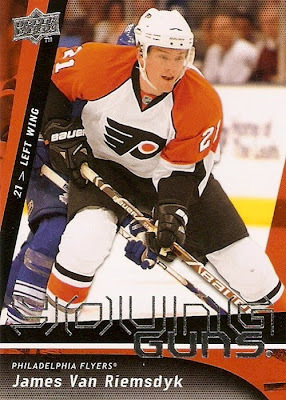 This pick comes from 2000-01 Pacific, its a Brian Boucher Net Fusion card. 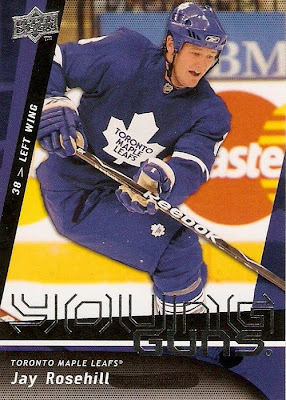 The cool thing about these cards is that it was something relatively new and unique at the time. It's got a nice overhead shot, which goes for all of the cards in this set, well at least for the two that I have, the other is a Stephan Fiset. These cards are made of a nice thick card stock and it's always cool to have a card you can see through somehow.